(PhysOrg.com) -- For the first time the transmission of data secured by quantum cryptography is demonstrated within a commercial telecommunications network. 41 partners from 12 European countries, including academics from the University of Bristol, have worked on realising this quantum cryptographic network since April 2004. Today [Wednesday 8 October] the first commercial communication network using unbreakable encryption based on quantum cryptography is demonstrated in Vienna, Austria. In particular the encryption utilises keys that are generated and distributed by means of quantum cryptographic technologies. Potential users of this network, such as government agencies, financial institutions or companies with distributed subsidiaries, can encrypt their confidential communication with the highest level of security using the quantum cryptographically generated keys. The network consists of six nodes and eight intermediary links with distances between 6km and 82km (seven links utilising commercial standard telecommunication optical fibres and one “free-space”-link along a line of sight between two telescopes). The links employ altogether six different quantum cryptographic technologies for key generation which are integrated into the network over standardised interfaces. 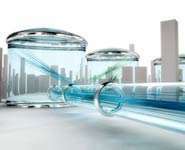 The network is installed in a standard optical fibre communication ring provided by SECOQC partners, Siemens AG Österreich in Vienna. Five subsidiaries of Siemens are connected to the network. The operation of the quantum cryptographic network will be visualised on a screen at the Siemens Forum in Vienna and streamed live over the Internet. The network-wide key generation and distribution will be demonstrated, the different functionalities of the network itself will be presented as well as utilisation of the keys for standard communication applications. A voice-over-iptelephone-application will be secured by the information-theoretically secure "one-time-pad-encryption“ while videoconferencing will be protected by symmetrical AES-encryption with frequent key changes. A low-cost key distributor, with the potential of extending the quantum cryptographic network to the consumer, will also be shown. Academics at Bristol University led by John Rarity, Professor of Optical Communication Systems in the Department of Electrical & Electronic Engineering, working on the project have developed a low cost free-space quantum cryptography system, complete with purpose-built software that can operate in daylight conditions. The system is designed to eventually work in applications where a consumer can regularly ‘top up’ a store of secrets for use in a variety of one-time-pad (OTP) and authentication protocols. This system could allow online consumer transactions to be PIN protected for instance. The user would use secret bits shared with the bank to encode his PIN. Confidential communication needs encryption in order to ensure that no unauthorised party could misuse the content. Quantum cryptography provides long-term security and thus conforms to the requirements of a number of recent legal regulations for protecting information. Quantum cryptographic technologies provide information-theoretically secure keys for encryption. The basic approach includes sending streams of specially prepared particles of light (photons), their measurement by the legitimate parties and the subsequent post-processing of the measurement data. The output is the cryptographic key consisting of identical random bit strings. A potential eavesdropper cannot gain any information on this key irrespectively of his resources. This property which has no classical counterpart is due to the fundamental laws of quantum physics which ensure that any measurement leaves indelible traces behind. These traces manifest themselves in an error-rate that can be identified by the legitimate users. There exists a quantitative relationship between the error-rate and rate of key generation: In case the error is below a certain upper bound, and therefore the eavesdroppers invention was sufficiently weak, the process of generating the cryptographic key is still possible with the same security standard but at a accordingly reduced rate. The latter gets equal to zero if the error-rate exceeds the bound. Previous developments in quantum cryptography focused on point-to-point connections between only one sender and one receiver and commercial solutions are already available from several companies (including the SECOQC-Partner id Quantique SA). Although these solutions are suitable for some applications such as connecting two data-centres in a metropolitan area, they cannot address all scenarios requiring secure communication. These limitations are related to a number of disadvantages of the point-to-point solutions: the maximum distance between sender and receiver is limited due to loss of photons in the optical fibre; the maximal speed of key generation is relatively low – it is comparable to that of a modem from the 1980’s – and the communication can be interrupted by simply cutting the fibre or interfering with the line of sight (in case of a free-space application). In a network, longer distances can be bridged and alternative paths between sender and receiver can automatically be chosen in order to increase key generation throughput or prevent denial-of-service-attacks even if a communication line is interrupted. Furthermore, in a network, more than two partners can simultaneously obtain keys for encrypting confidential communication. This development will open up the possibility for telecom operators to develop novel services and products based on quantum cryptography. Why are the only customers the government, banks, and corporations?? In the larger picture there is no such thing as an unbreakable encryption system because the humans who run the systems are not infallible. I find it funny that governments spend millions of database security then a government worker loses his laptop on a commuter train. ^Even computer programs are subject to fallibility, as the people behind the programs are fallible themselves. In fact, there is a movement towards the opposite. I don't know if you have heard of it but it is kinda of a big deal - it is the goal to develop an Artificial Intelligence. Interesting how AI concepts are based around human thought structure. Even machines that program themselves would be inherently based rules of logic that were programmed by humans. There will ALWAYS be the human factor, no matter how weak you believe it to be. @modernmystic: "I think the little guy needs this every bit as much as they do..." - If not more so than everything else! But, for this to happen, the people must develop and distribute it amongst themselves instead of relying on the government, banks, and corporations to front the effort. IMHO, once society has reached this level of thought and willingness to action, there will no longer be a need for government, banks, or corporations; which is precisely what these institutions, wrought in greed, would attempt to avoid at all costs. The tech factor is never 100% secure. That we can make unbreakable encryption, such as a one-time pad or quantum encryption, is one of the great rarities in the computer world: a technology that has even one single piece that is completely secure. But the *computers* are never completely secure, and encryption can only make *one piece* of the system secure. Create perfect encryption, and only the *middle* of the communication is secure. Anybody smart enough to threaten modern cryptography directly (requiring this new cryptography to stop) already can own your computer (or your correspondent's) at will, and just read the message when you do. It does give us one benefit, though: if someone's only source of information is interception of the message, that person is utterly stymied (think NSA). But this is far more likely for a big business or the military than for you or I. It *is* being researched for the little guy. Once they have this working, it will be given to any little guy who can pay millions of dollars for security that allows the *transmission of the information only* to go from "unbreakable by any means known" to "unbreakable by any means theoretically possible". Frankly, I think I have a better use for my millions. But if you routinely use your home computer to send military secrets or manage billions of dollars, then by all means, buy some of this, once you have made your home computer utterly invulnerable, as well as those of everybody you talk to. But I recommend that you let the military and big business subsidize the research, unless you are Carlos Slim Helú or Osama bin Ladin.